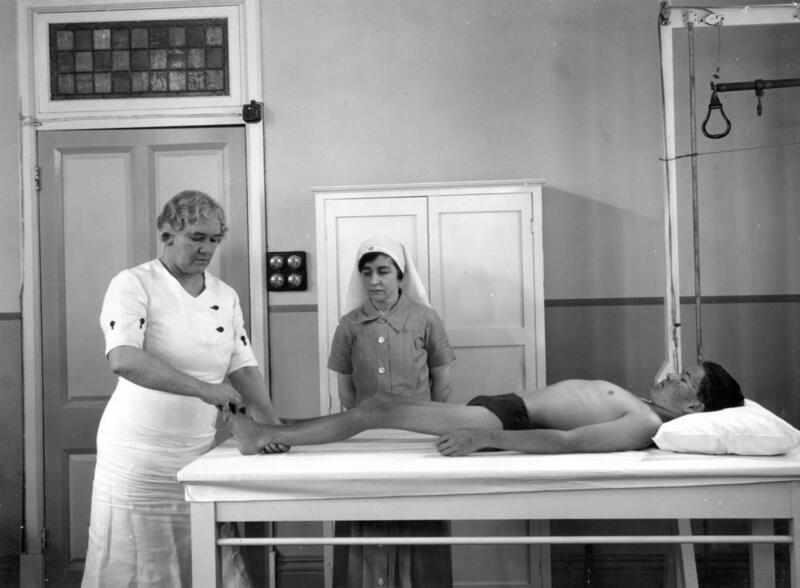 Sister Elizabeth Kenny (shown above demonstrating her therapy) became somewhat of a celebrity, albeit a controversial one, in Australia and overseas as a result of her treatment of "infantile paralysis", or what is now called polio. In his article for the series "The Way We Were", currently being run by the Courier-Mail to celebrate Queensland's 150-year anniversary, Brendan O'Malley recounts how much she was loved by her patients and their families. She opened a clinic in Townsville in 1934, and then this one, on the corner of George and Charlotte Streets in Brisbane, in 1935. In 1940, The Queensland Government paid for Sister Kenny to travel to the United States to promote her methods for the treatment of polio. She eventually moved to the States, where benefactors established further clinics for her. Unfortunately, Kenny developed Parkinson's disease, and she returned to retire in Toowoomba in 1951, and passed away there in 1952. I don't know what happened to the clinic, but the George and Charlotte Street corner is now dominated by this huge office tower, too big even for a wide angle lens. It may contain State Government public servants - I wonder how many of them are aware of the significance of the site.